A satellite that will be the first to comprehensively monitor wind around the globe is finally ready to fly. After nearly two decades in the planning, the European Space Agency’s (ESA’s) Aeolus mission is slated to launch from Kourou, French Guiana, on 21 August. Meteorologists think that its data will significantly improve weather forecasts, because the lack of detailed wind measurements is one of the biggest gaps in the global Earth-observing system. Aeolus, a €480-million (US$550-million) mission, will use ultraviolet lasers to track wind speed and direction in the lowermost 30 kilometres of the atmosphere. Researchers have used similar lasers on aeroplanes to study winds in particular regions, but this will be the first wind-mapping mission to cover the entire globe. If Aeolus works as planned, its data could improve forecasts in tropical regions substantially, and by a few per cent in Earth’s mid- and high latitudes. “You may think that does not sound like very much, but if we improve forecasts by 2%, the value for society is many billions of dollars,” says Lars Isaksen, a meteorologist at the European Centre for Medium-Range Weather Forecasts (ECMWF) in Reading, UK. Better forecasts allow people to better prepare for storms, for example. Until now, meteorologists have pieced together information on winds from a patchwork of sources, including weather balloons and aeroplane flights. No satellite has directly measured winds, although scientists can infer wind speed and direction from satellite measurements of, for instance, how clouds move. ESA selected the mission, named for the keeper of the winds in Greek mythology, in 1999. “It’s been a long road,” says Anders Elfving, the mission’s project manager. It is reaching the launch pad only now because of the difficulties in building a space-based laser that would be capable of generating the required power of around 10 megawatts in each pulse. Among other challenges, the laser blasts initially created a thin layer of dark material on the system’s optical instruments. Engineers eventually added a tiny amount of oxygen to the set-up, no more than that produced by a photosynthesizing leaf, to protect the instruments’ surfaces from contamination. 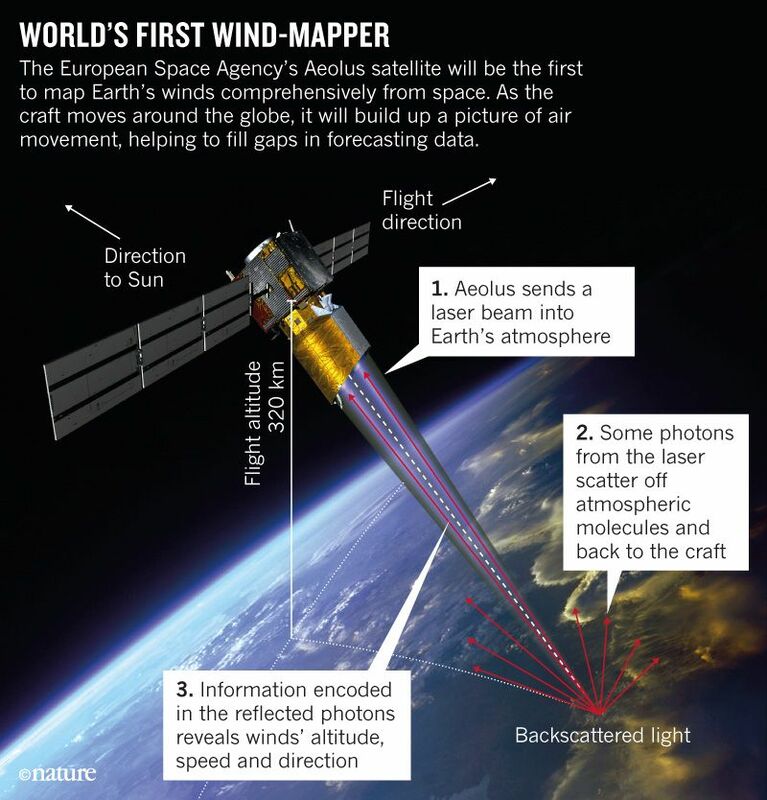 Fifty times each second, Aeolus’s laser will zap Earth’s atmosphere with a beam of billions of ultraviolet photons (see ‘World’s first wind-mapper’). A few hundred of those photons will bounce off air molecules and particles and will reflect back to the spacecraft’s 1.5-metre primary telescope. Aeolus will measure not only the distance to the reflection—giving the altitude of the winds—but also the tiny change in wavelength created as the molecules move back and forth. That ‘Doppler shift’ allows scientists to calculate the winds’ speed and direction. “It’s much more challenging than just measuring the signal coming back,” says Oliver Reitebuch, an atmospheric physicist at the German Aerospace Center in Oberpfaffenhofen, who led aeroplane flights to test Aeolus’s technology. The information will, for instance, allow scientists to track different wind velocities at different altitudes in the atmosphere—information that is important for understanding developing storms, but that cannot be obtained globally in any other way. Aeolus’s data will feed into numerical weather predictions, in which national weather services incorporate atmospheric conditions such as temperature, pressure and humidity to generate forecasts for the coming days. Not incorporating winds can lead to big errors: in one study, the ECMWF analysed a rainstorm in Europe in March 2014, and found that, if they had had better data on winds above the Pacific Ocean days earlier, their forecast would have more accurately predicted the heavy rains to come. Forecasts are expected to be most improved in the tropics, in part because there are relatively few weather-balloon flights in that region. Winds are also less tightly coupled to other atmospheric factors in the tropics, which means that it is harder there than in mid-latitude areas to guess at wind speeds and directions when data such as temperature and pressure are known. Aeolus’s laser cannot see through thick clouds, so it will not be able to penetrate storm systems such as cyclones, says Alain Dabas, a meteorologist with the Météo-France forecast agency in Toulouse, France. But it will be able to track other phenomena such as dust blowing off the Sahara desert, or plumes of pollutants spreading into different altitudes. “I’m certain there will be some interesting discoveries to be made,” says Sara Tucker, an engineer at Ball Aerospace in Boulder, Colorado, who works on laser measurements of wind. If Aeolus launches successfully, mission controllers plan to switch on the laser system in September, with initial data arriving by the end of January 2019 and inserted into forecast systems by that April. The goal is to have wind measurements available no later than three hours after the satellite gathers them. The mission has a lifetime of three years. But if Aeolus’s technology proves solid, it could help pave the way for future wind-mapping satellites, says Lars Peter Riishojgaard, head of the World Meteorological Organization’s Integrated Global Observing System in Geneva, Switzerland. This article is reproduced with permission and was first published on August 17, 2018.